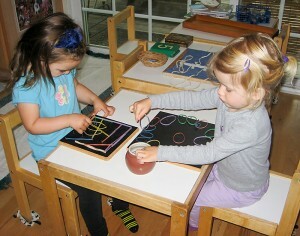 Montessori is a teaching method that is recognized world-wide. 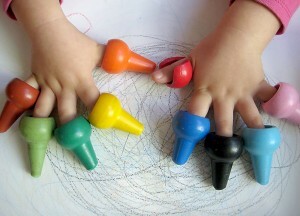 It was developed in Italy in the early 1900’s by Dr. Maria Montessori. Its basic premise is that children work best in a multiple-age classroom with the power of choice. With this power of choice comes responsibility. This allows for peer teaching, broad social interactions, individual differences in learning style and pace, and creates a social community of family. It provides the youngest students with a graded series of role models and the older students with peer teaching opportunities for reinforcement of learning. The basic tenet of Montessori education is that a child learns best in an enriched, supportive environment through exploration, discovery and creativity with the guidance and encouragement of a trained and caring staff. Children are encouraged to pursue their interests, make responsible choices for themselves and direct themselves to constructive activities. Since children’s interests vary, this opportunity results in an independent, self-motivated learner. The school environment is prepared with a variety of specially designed Montessori materials – multi-sensory, sequential and self-correcting. Educational materials are carefully selected to meet the needs of range of students in each class and to meet the goals of the program. The use of materials for learning in the Montessori classroom is an integral part of the program from pre-school through the elementary years. Based on a belief that children learn by doing, lessons for math, language and all subject areas include hands-on materials for use by the student. The goals of Montessori education are to cultivate each child’s natural desire to learn, acquire and master skills, learn responsibility and cooperation and foster strong, positive feelings about one’s self and others. The method addresses the total child developing social skills, emotional growth, physical coordination, and cognitive preparation, within a thoughtfully designed environment. In essence, the Montessori method looks to follow the child; to guide and nurture the learning process. The basic philosophy, as stated by Maria Montessori herself… “Never let a child risk failure until he has a reasonable chance of success.” This sets the tone for a happy, productive school day for the child. Dr. Maria Montessori (1870-1952) was the first woman in Italy to receive a medical degree. She worked in the fields of psychiatry, education and anthropology. She believed that each child is born with a unique potential to be revealed, rather than as a “blank slate” waiting to be written upon. Dr. Montessori devoted her life to understanding how children develop socially, intellectually, physically, and spiritually. By carefully observing children all over the world, she discovered universal patterns of development which are found in all children regardless of their culture or the era in which they live. Maria Montessori was a visionary, not easily daunted by the many challenges she faced during her career. She traveled extensively, lecturing and teaching throughout Europe, India and in the United States. She was recognized for her efforts by educators, psychologists and political leaders of the day. Her associates included such people as Anna Freud, Erik Erikson, Mahatma Gandhi, Alexander Graham Bell and Jean Piaget. Dr. Maria Montessori began her educational journey teaching children in a mental institution, convinced that with appropriate techniques she could make a real difference. A number of the children made such significant progress that when she entered them in mainstream examinations they outperformed other children educated in ordinary schools. Montessori then realized that something must be wrong with the mainstream teaching for this to have happened and she set about researching how children could be better taught. In 1907 Montessori was appointed as the director of a nursery for 50 three- to six-year olds in a slum area of Rome, set up by the housing authority to keep the children off the streets. And so began the first “Casa dei Bambini”. Montessori used the same techniques she had used at the mental institution, allowing the children to work independently and to choose the activities that interested them. She was led by the children and carefully observed how they learned and what materials they chose to use. She noticed that as the children worked with the materials they developed considerable powers of concentration and self-discipline. She developed new materials and discarded any that did not appeal to the children. She developed the theories of the Montessori Method based on careful observation of what children revealed about their developmental needs. Dr. Maria Montessori referred to the first stage in human development (birth to age 6) as the time of the Absorbent Mind. She knew these first six years of life to be the most fundamental in the development of human beings. This stage of a child’s intellectual and emotional development is different from any other time of life; children are literally creating the people they will become. At this stage children are sensory explorers, building their intellects by absorbing every aspect of their environment, culture, and language. The Montessori Method has, for a century, proved to be an outstanding early childhood educational technique.